Update Nov 15th: Heather Jackson and Angela Naeth are no longer on the current startlist. The Course Rating for IM Arizona is 14:58. IM Arizona is a P-2000 race. It has a total prize purse of 80.000 US$. 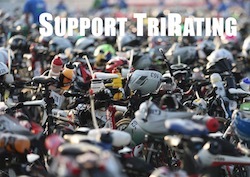 The strength of the field is 28% of a typical Kona field. Last two year’s winner (and second in Kona), Lionel Sanders, is the clear favorite on the men’s side, but Brent McMahon will be looking for a good race after his DNF in Kona this year. Meredith Kessler has won IM Arizona for the last three years, this year she won’t be able to race as she’s about to join the ranks of super-moms. In her absence it promises to be an interesting race with a strong and deep field. Kaisa has been doing well on fast courses, but so far Heather has always been able to finish ahead of her when they started the same race. Angela Naeth is returning from a long-term injury, I’m not sure how aggressive she’ll be racing. (Last year she went even faster than the bike course record – 4:36 – but was forced to end her race shortly after T2.) With Michelle Vesterby and Sarah Piampiano there are two more contenders for the win – both of them are coming off a DNF in Kona and will look for a good result to have a decent start to their 2018 seasons. An interesting addition is Helle Frederiksen who could do her first full-distance race (at this point she’s still on both the Arizona and Cozumel start lists) – as she hasn’t done an IM yet she’s unrated and I have no basis to calculate her odds.